Looking Gorgeous and add ever cute, Kim Kardashian and Kanye West‘s daughter is probably the most fashionable and adorable 1 year old celebrities in the world in recent times. Little do we know why her parents decided to do a body double for North West in a disguise to keep paparazzi away from her. 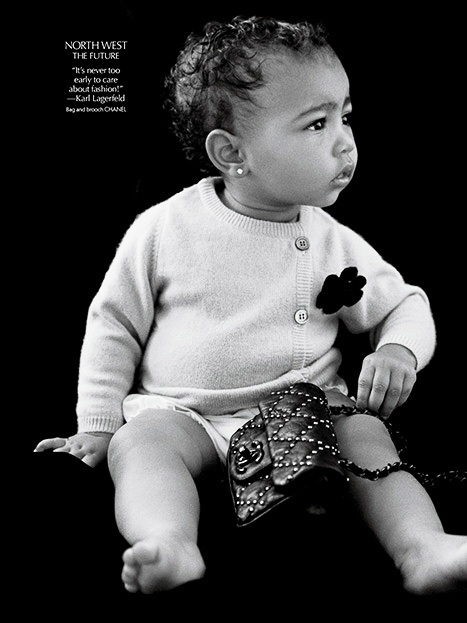 North West makes her first solo modelling debut rocking nothing but Chanel . The little princess stars in an editorial spread for the fall issue of CR Fashion Book. In the black-and-white shot, the future fashionista is wearing a Chanel brooch and a bag as well as Lorriane Schwartz diamond studs.